Stephen R. Wooten is a sociocultural anthropologist whose research interests include: political economy and ecology, local food systems and expressive culture. Dr. Wooten has been conducting ethnographic field research in Mali since 1992 and has recently begun a study of urban agriculture in Eugene. His research publications include: “Colonial Administration and the Ethnography of the Family in the French Soudan” in Cahiers d’etudes africaines, “Antelope Headdresses and Champion Farmers: Negotiating Meaning and Identity through the Bamana Ciwara Complex” in African Arts and “Losing Ground: Gender Relations, Commercial Horticulture and Threats to Local Plant Diversity in Rural Mali” in an edited volume entitled: Women and Plants: Gender Relations in Biodiversity Management and Conservation. His book The Art of Livelihood: Creating Expressive Agri-Culture in Rural Mali explores the creativity of rural Bamana people. 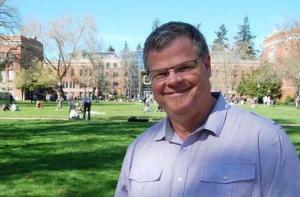 Dr. Wooten has been at UO since 2001.